Chittagong District Administration on Monday decided to disconnect utility services from unauthorized dwelling houses that were illegally set up on the hillocks and risky places in the city. The meeting of Hill Management Committee held at Chittagong Divisional Commissioner's office decided to disconnect electricity and gas supplies to unauthorized dwelling houses on risky hills, BSS reports. The move was taken in order to avert possible loss of lives from landslides in the monsoon as the soil on the hills become softer and may trigger a landslide, posing threat to the lives of the low-living people dwelling on those risky hills pockets during the rainy season. The meeting also decided to stop services of the NGOs working in risky hill areas, evict unauthorized dwelling houses and stop hill cutting. Chittagong Divisional Commissioner Mohammad Ruhul Amin declared the decisions in the meeting while Additional Divisional Commissioner Mominur Rashid, Deputy Commissioner of Chittagong Mejbah Uddin, Director of the Directorate of Environment Mokbul Hossain, Deputy Police Commissioner Paritosh Ghose and Railway Estate Officer Jasim Uddin, among others, addressed it. The district administration at the advent of the monsoon every year, takes different rehabilitation programmes to relocate the risky hill-dwellers but in spite of knowing the impending dangers, the people of low income group mostly the rickshaw pullers and day labourers erect their temporary structures and start living in those hills. 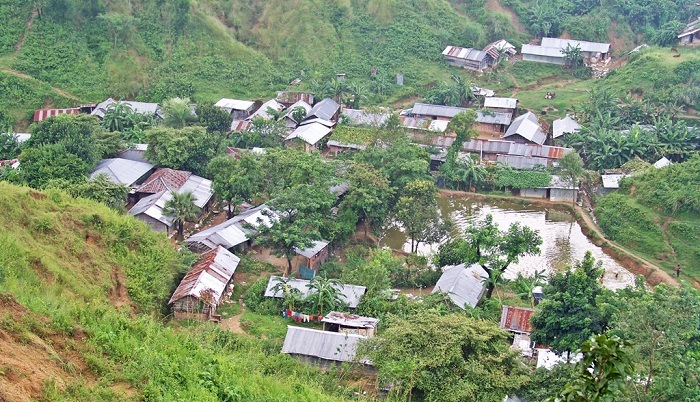 According to the reports provided by the Chittagong Hill Management Committee, a total of 13 hills in the city are in very dangerous state to live there. At least 180 persons were killed in different landslides in the city during last eight years including 127 dead on June 11 of 2007.